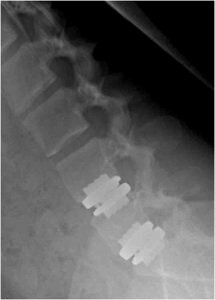 Lumbar Artificial Disc Replacement is a technology designed to replace	a symptomatic lumbar degenerated disc with a metal and plastic ball and	socket prosthesis. A symptomatic disc is defined as causing low back (axial)	or leg (radicular) pain with or without a functional or neurologic deficit. Examples of structurally degenerated discs are herniated nucleus pulposes	(your classic ‘herniated disc’), mild instability on motion,	loss of disc height or hydration of the disc (like a sponge drying out),	and vacuum phenomenon (air in the disc). The L-ADR is inserted through a front side (anterior) approach. It is implanted	at the diseased level after the disc has been completely removed (total	discectomy). The discectomy and removal of bone spurs will decompress	the nerves. The implanted L-ADR will maintain the joint space height and	potentially preserve motion at the surgically corrected level. This motion	preservation may theoretically prevent or slow the progression of adjacent	disc levels from degenerating. Here we have an example of a patient who suffered from mainly back pain,	with some leg pain, for several years. She failed conservative management	in the form of physical therapy, spinal injections, oral medications,	and activity modification. She underwent an artificial disc replacement	at L4-5 and L5-S1. At two and a half year follow-up, her pain decreased	from 8/10 pre-op to 0, and she was training for a half marathon. Here is an example of a patient who underwent a DLIF procedure. In her	late eighties, she suffered with back and bilateral leg pain for many	years. She was unable to stand for 5 minutes due to pain. 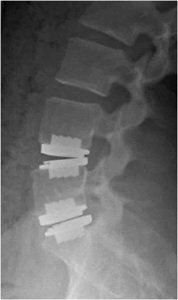 She had a spondylolisthesis	at L4-L5 that was treated with DLIF, pedicle screws, and decompression. At last follow-up 2 years after the surgery, the patient was able to stand	for 20-30 minutes and her pain was reduced to half of the pre-op level. Figure 1. Post-op lateral flexion x-ray showing artificial discs at L4-5	and L5-S1. Figure 2. Post-op lateral extension x-ray showing motion of artificial	disc opening up in front, especially at L4-5. For a description of the PLIF,	please click here. We prefer a TLIF to a PLIF because we think it requires less nerve root	retraction and is safer for the patient. They are very similar procedures,	both done from the back. Check out the amazing success stories from our patients. Our expert surgeons will help determine the approach that is right for you. Contact us to request a consultation with one of our doctors. Expert Spine Specialists in Santa Monica, CA | Marina Spine Center | © 2017 All Rights Reserved.